Cleto Rodriguez and another soldier fought for nearly two and half hours, holding off the enemy by themselves during the Battle of Manila in the Philippines. Samantha Wickwire (left) places a vase of roses at the headstone of San Marcos native Cleto Rodriguez (above) at Fort Sam Houston National Cemetery during a ceremony honoring the cemetery's Medal of Honor recipients held in 2007. Wickwire is the granddaughter of Medal of Honor recipient Jose Lopez of Brownsville. Master Sgt. Cleto Luna Rodriguez received the Medal of Honor for aiding “the advance of our troops” during the Battle of Manila in World War II. Rodriguez was born on April 26, 1923, in San Marcos. He moved with relatives to San Antonio, where he was raised, after both of his parents died when he was 9 years old. He worked at the historic Gunter Hotel, now the Sheraton Gunter Hotel, in downtown San Antonio, and as a newsboy selling papers. Rodriguez was a private with Company B of the 148th Infantry after he entered the U.S. Army in 1944. He was an automatic rifleman when his unit attacked the strongly defended Paco Railroad Station during the battle for Manila, Philippine Islands, according to the Medal of Honor citation. While making a frontal assault across an open field, his platoon was halted 100 yards from the station by intense enemy fire. Rodriguez, along with Pfc. John Reese, from Pryor, Oklahoma, took matters into their own hands and charged the enemy soldiers, stopping at a house about 60 yards from the Japanese defenses. Firing from that location, the two men killed 35 enemy soldiers and wounded many more. Rodriguez and Reese spotted enemy reinforcements advancing and killed more than 40 more of the troops. Reese gave Rodriguez covering fire so Rodriguez could charge the station. 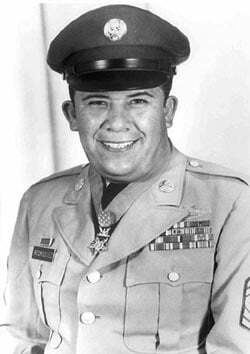 Once he was in position, Rodriguez launched five grenades through the doorway, destroying a 20-millimeter gun, a heavy machine gun, and more enemy soldiers. The two Americans fought for nearly two and half hours, holding off the enemy by themselves. Running low on ammunition, they eventually attempted to retreat to the Company B location. Reese was mortally wounded as they made that move. Both men were awarded the Medal of Honor for their deeds that day, Feb. 9, 1945. Rodriguez continued to display his heroism in the Philippines. A few days later, he single-handedly helped his unit advance in Manila when he killed six Japanese soldiers and destroyed another 20-mm gun. The Texas native returned to San Antonio after the war. He went on to serve in the U.S. Air Force from 1952 to 1954 before rejoining the Army, where he served from 1955 to 1970. He was married and had three children. His childhood school of Ivanhoe Elementary School in San Antonio was renamed Cleto Rodriguez School in 1975. In addition, an 8.5 mile stretch of Texas highway 90, from I-410 to I-35, has been named in his honor. A small arms firing range at Ohio National Guard Training Site, Camp Perry, Ohio has been named in honor of Rodriguez. Camp Perry is the home of the National Rifle and Pistol Championships. Rodriguez died on Dec. 7, 1990. His grave is at Fort Sam Houston National Cemetery. The Medal of Honor feature runs every other Sunday, alternating with “Voices of Valor,” which focuses on Central Texas veterans. To suggest a story of a Central Texas veteran, email voicesofvalor@wacotrib.com.